… Green Gold is involved in many areas. … at the CannaBusiness 2004 in Cologne. The new AroMed 4.0 has not only aroused enthusiasm among the Cologne public. Howard Marks was thrilled with the new AroMed! Please click on the pictures to view a larger version. THE AROMA EVOLUTION IS ONE STEP MORE! What has not happened since Frank Fuchs launched its first vaporizer onto the completely unprepared market about eight years ago. 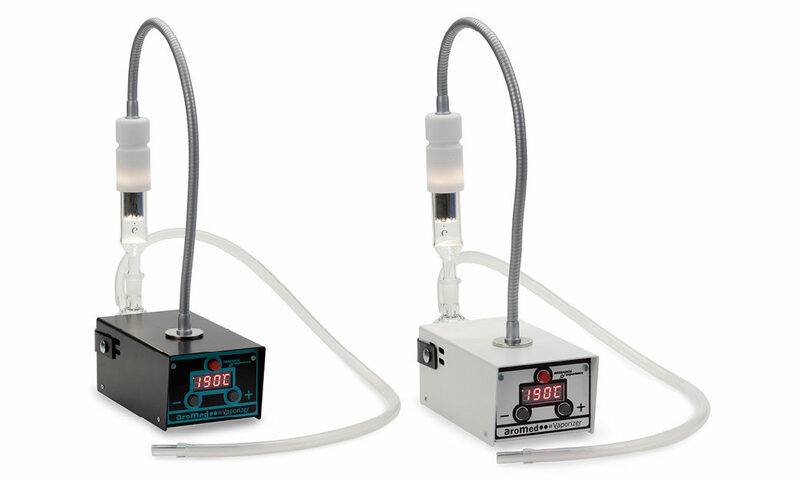 Meanwhile, the vaporizer offer is wider – and we are in the development continues. In eight years, a lot of research and experience, also because we have made addition to the device with Bert Marco Schuldes and Richi Moschers book phyto-inhalation, a standard work for inhalation available. The stimulating feedback from consumers, physicians and distributors has sparked some innovation. So now we have our new device, AroMed 4.0, ready. Externally barely distinguishable from its proven predecessor, it follows the specifications of the “form-follows-function” design. Basically – and that’s what it’s all about – you can still inhale the active ingredients from almost all medicinal plants mildly and gently. The required temperature can be exactly defined and set. The standard equipment now includes the Magic Glass® water filter with a newly developed precision process herbal holder with a 14mm cut. The modified heating handle made of high-quality PTFE (Teflon®) on the proven gooseneck fits perfectly on the new herb holder. New is the standard handy carrying case; a jewel that you would like to take with friends and traveling. The still unique electronics have been completely redesigned and brought up to date. With a maximum power consumption of only 60 watts, it provides even more heating power. This is sufficient for the extraction of all active ingredients from medicinal plants, aromatic oils and tinctures. The temperature control is now much more precise and manageable. With a new thermo-resistance fluctuating room temperatures are recorded and included in the hot air generation. The maximum temperature of 235 ° C (455 ° F) is reached after about 2 minutes. The AroMed 4.0 is to be deployed globally: the new power supply allows connection to AC voltage of 90-250 V (50-60 Hz). Temperatures in Fahrenheit (° F) that are frequently read on the Internet no longer have to be converted: one touch of a button is enough and an alternative display in ° F is possible. This also as a concession to the fast-growing AroMed user community in the US and Asia. For these regions, 90 or 115-volt special models no longer have to be offered, and travelers no longer need a transformer. From now on, each AroMed device comes with a newly revised manual in four languages. Almost all active ingredients of the materials in the herb holder are inhaled. There are – unlike some other vaporizers with blowers or restraint systems – no scattering losses. No active ingredients are released or condensed between breaths. This guarantees a very high efficiency. The eye inhales, the Vaporisier-Gut in the glass holder can be observed at any time. The last selected temperature is saved when switching off and is immediately available when switched on again. Green Gold does not claim to lure the consumer with a hip presentation – it is important to us what is in the box and what can be achieved – for the benefit of the inhaler (s). A first medical field trial with asthma bronchial patients at the University of Santiago de Cuba has just been successfully completed. Sage and thyme, inhaled with the AroMed 3.1 vaporizer, were significantly faster, better, and longer lasting than those given to a control group of Salbutamol inhaler aerosol spray in patients 6-65 years of age – all without the inhalation aerosol typical Side effects, such. B. tachycardia. Inhaling with the AroMed vaporizer is not only the healthier, chemistry-free alternative, but also makes a significant contribution to reducing drug costs! One dose of salbutamol costs 12 to 15 times the equivalent effective dose of vaporized medicinal herbs. Other applications, e.g. in pain syndromes, relief of side effects of chemotherapy, Waste syndrome in cancer patients, menstrual and other convulsions are z. Currently in the trial. As soon as new findings are available, they will be published here. Howard Marks is also thrilled with the new AroMed 4.0! … at the University of Santiago de Cuba. In 1997, Frank Fuchs established its first contacts with doctors in Cuba. Regular medication and material donations are organized. The level of knowledge of the Cuban doctors, who have earned a doctorate at the Humboldt University in Berlin, is very high, but the US’s blockade policy has limited resources. Although this has improved a lot in the new millennium, there is still a great deal of interest in alternative and natural remedies and research is wide-ranging. Meanwhile, there is a flourishing health tourism that also brings foreign currency into the country. Ophthalmology using lasers, plastic surgery, dentistry and addiction therapies are of a high standard and are widely accepted by Canadian patients. The offer to organize a field trial with the AroMed vaporizer came from the Cuban side. Phyto-therapies are widely practiced, and so these field trials were only a logical consequence. Here is an excerpt of the experimental protocol of a series of studies with severe, sometimes long-standing, chronic asthma patients. Further attempts have started, or in preparation. Treatment with phyto-inhalation using sage and thyme in Consultorio 51 in patients with severe asthma. Treatment of asthma with the AroMed Vaporizer using phyto-inhalation with sage and thyme. Patients were divided into two groups, one treated by phyto-inhalation and the other by conventional medication. … The control group inhaled salbutamol (2cc salbutamol and 2cc serum physiologic) with a spray inhaler … The results obtained enable clinical staff to put the scientific information on phyto-inhalation into practice …. Implementation of the results allows the development of new treatment methods, which in turn lead to improved findings. The trial found that the asthma patients treated with phyto-inhalation experienced a similar improvement to those of the control group with conventional drugs, but without any side effects, in contrast to the control group …..
Of interest is the continuation of the study on treatment with phyto-inhalation in other complaints …..
… is actively supported by Frank Fuchs. The Arbeitsgemeinschaft Cannabis als Medizin (ACM e.V.) is the lay and affected organization of the global scientific community IACM (International Association of Cannabis as a Medicine). Dr. Franjo Grotenhermen, himself affected, is founder and driving force of these organizations. It publishes a regular newsletter for members and interested parties. Any information about important new developments, the current legal situation in different countries, and tips for those affected can be found there. Of course, this uniquely competent information is also available on the Internet: www.cannabis-med.org (multilingual!). Green Gold always gratefully uses these sources. Of course, non-affected people are always welcome as members of ACM e.V. The contribution to the membership is, of course, tax deductible. … selected articles and texts. Notes: Many authors refer to vaporizers as an “inhalation technique”; Cuban physicians who perform tests with the AroMed and various medicinal herbs call this method “phyto-inhalation”. “Inhalation” and “phyto-inhalation” are medical terms that we do not wish to see used until complete proof of medical efficacy has been obtained for our product. The medical field trial with our devices will be documented in a few months. Then the AroMed vaporizer is an “official” inhaler. Similarly, some authors use the brand name “aromizer” in their texts. Again, we would like to point out that “aromizer” is a registered name of another company and may not be used in connection with the AroMed vaporizer. The articles are written at a time when this was not yet known.